The Hexa is an embodiment of Tata’s aspirations to transform into a modern, stylish and sophisticated brand. But, can the Hexa shake off the legacy of the 'old' Tata and make a mark in the full-size SUV segment? And just how different is it from the Aria crossover? We find out. Update: The Tata Hexa has received an update for 2019 which includes a new 7-inch touch screen, dual-tone paint options and two new alloy wheel patterns. Read all about it here. Our expectations from Tata vehicles have changed massively. The ‘Tata’ logo is now associated with distinctive designs that wrap around capable machines that also promise to pamper you. Tata’s previous challenger in the seven-seat family mover space, the Aria, lacked appeal and the ability to tackle the utterly capable Toyota Innova Crysta. As expected of new-age Tata, the seven-seat Hexa is packing in a lot more wow-power to tempt you into a showroom. But is this Aria-based offering the real deal now? Will it get you to your destination with ease, be it near or far, and whether you like to drive or be driven? Answer time! Because it’s only when you do that will you be able to miss the Hexa’s connection to the Aria. Tata may want you to think that the Hexa is an 'all-new' product, but it is difficult to gloss over the fact that this is a heavily reworked Aria at best. When you accept that fact, stop squinting. Now look at it, and it is easy to appreciate the Hexa's design. From the front, the high-set clamshell bonnet, the swept-up headlamps, upswept chrome bar in the grille, the air dam with a large hexagonal surround, faux air intake with integrated LED DRLs and fog lamps make the Hexa look handsome. While the crossover-like lines and proportions clearly show through, Tata has tried to add butch-looking elements at the side. The flared wheel arches, lower plastic cladding throughout, roof rails, 19-inch dual-spoke alloy wheels, and blackened pillars which create a 'floating roof' effect add a tough but luxurious look. There are subtle body surfacing details which need the right light conditions to be noticed, especially when the Hexa has adorned darker shades of paint. The ORVMs are huge, and the covers have integrated LED turn indicators. The prominent Hexa branding on a chrome strip on the large third-row window is a nice touch but can be difficult to maintain. Chrome strips are also used on the door handles to add a bit more flair and increase the sense of premiumness. Step a little further back and you’ll agree with me that the Tata Hexa looks the best when viewed at from the rear quarter. Modern, contemporary and handsome are the words that immediately pop to mind. Individual elements are intriguing too, like the horizontal tail lights that contain suave LED brake lights. The Tata Hexa is a tall vehicle, with a ground clearance of 209mm. Stepping into the cabin requires a big step up because instead of a traditional side-step, there is a heavy duty plastic extension that is almost at the same height as that of the door sill. Moreover, the lack of conveniently placed grab handles also hinders easy ingress. On the flip side, this high-mounted side-step won’t scrape anywhere if you decide to take the Hexa off-roading. 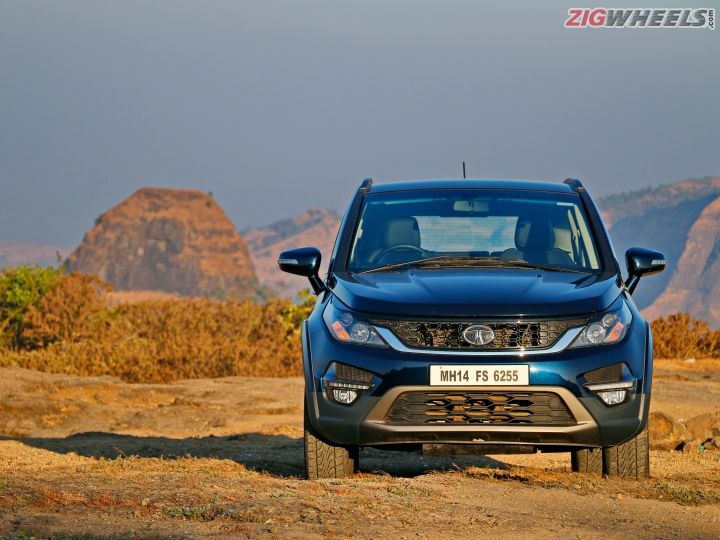 Recommended Read: Is the Tata Hexa better than the competition? Step inside and an almost all-black cabin greets you. Tata has used brushed grey plastic and piano-black inserts to give some relief, and the overall effect is of restraint. The Hexa’s attitude leans towards sophistication rather than youthfulness or sportiness. On the whole, a lot of effort has been spent to make the dashboard look good, but the multitude of materials and plastics detract from the classy design. The steering wheel will look familiar to those who have sat in the new generation cars from Tata. Buttons on the large four-spoke wheel allow you to control the infotainment system, hands-free telephony system and the cruise control. The instrument cluster consists of two large analogue dials with a 3.5-inch driver information display (DIS) in between. The DIS is informative, and you can toggle through the items using the right hand-side steering-mounted stalk. The centre console is neatly divided - at the top are two A/C vents with chrome surrounds, below which is the infotainment screen. Set in the wide swath of piano black plastic the 5-inch touchscreen looks a bit small. It is in fact no bigger than the units fitted on the Zest or the Bolt! It supports smartphone connectivity via Tata's dedicated apps or through Apple CarPlay and Android Auto. There is the brilliant Juke app, which auto creates a song playlist from the phones of all the passengers in the car. But the small screen requires quite a bit of scrolling to access these features. The 10-speaker JBL system seemed underwhelming during our tests, which is a shame considering the JBL/Harman systems on lesser cars from Tata have been brilliant. Below the screen sit a row of buttons (of which only three are usable). The climate control module sits underneath and finally, there is the section that houses a 12V charging point, the 'Super Drive Modes' rotary selector and the USB/AUX points. The placements of some of the buttons, like the door lock/unlock button, seem confusing. It is placed in the centre console, and you may end up searching for it for a long time on the driver-side door pad. In case you need to unlock individual doors from the inside, you have to use the pull-type locks on the doors which are difficult to operate. All the seats on the Hexa look and feel nice thanks to the leather covers with white contrast stitching. The seats are also well bolstered with healthy cushioning and padding. The driver seat is eight-way adjustable, including lumbar support. The footwell is tight for the driver, though, as the central tunnel eats into the space and that eats into the room available for your left foot to rest. The steering can be adjusted for rake but not for reach, which is a big omission considering the Hexa is being billed as a premium product. This also makes getting into a comfortable driving position a chore. The centre armrest at the front is handy for the passenger; however, on the driver side there is a cutout for the handbrake lever which cuts down on the comfort somewhat. The large door pads have enough space to keep one large bottle and some other knick-knacks. The second-row bench seats are very comfortable, and passengers have a good view out front and from the side windows. The seats are very flexible - they can be pushed forward/back, the seat back angle can be adjusted, and they can be split-folded 60:40. Passengers will appreciate the manually deployable side shades. The individual A/C vents on the floor-mounted console and door pillars are good enough to cool down the cabin fast. The blower speeds can be controlled independently of the climate control settings at the front via a roof-mounted console. The second-row seats have adjustable headrests for the outermost passengers only. The centre passenger also has to make do with just a lap belt. Entering the third row is accessible by tumble-folding the second-row seat forward. The third-row passengers do get individual three-point seatbelts, headrests and conveniently placed storage space. The seat back is comfortable and the legroom is decent but you sit in a knees-up position, and the headroom is just about adequate. It is best used for shorter distances by adults or by kids. The 128-litre boot space with all the seats are up is not too great, but it can fit some soft bags. The third row can be folded down to free up more space, but they do not fold flat. Planting heavy luggage may be problematic as the loading lip is high. Open the hydraulic struts-assisted bonnet, and you are greeted by a packed engine bay. The 2.2-litre VARICOR 400 turbocharged and intercooled motor stares back. The XT 4X4 variant only comes with a 6-speed manual transmission and not the new 6-speed automatic, which we raved about during the first drive conducted late in 2016. It is the only chink in the otherwise good driving characteristics of the Hexa. Tata has begun to be known for making cars which are good to drive, and the Hexa continues the trend. The engine is refined and picks up speeds after 1500rpm. The clutch is light and aids in fast shifts. But the gearbox is a bit troublesome. You need to stretch a bit when nudging the the first and second gear. You need to use force when shifting into some gears. As you work the gearbox repeatedly, it gets quite annoying. Recommended Read: The Tata Hexa AT is impressive! The Tata Hexa’s Super Drive Modes deserve a special mention here; these are definitely not just gimmicks. Tata seems to have taken the help of Land Rover to design an intelligent AWD system with selectable modes. The drive modes include - Auto, Comfort, Dynamic and Rough Road. In most conditions, the Hexa is a rear-wheel-drive SUV - in Auto the system can send power to the front wheels for the best stability or traction in a given situation. Comfort mode is all about a sedate driving feel and the perception of comfort that this imparts - throttle inputs are softened but the Hexa doesn’t feel sluggish. The Hexa seems to wake up in Dynamic mode, with throttle inputs rewarded instantly with progress on the road. After driving the Hexa for an extended period, what I have felt is that it is better suited for wide open roads than congested city ones. The biggest problem for city driving is not its dimensions, even though it is almost five metres long and two metres wide. It is the engine-gearbox combination, which, at low speeds, requires constant shifting to keep the engine in the sweet spot above 1500rpm. It otherwise feels sluggish, and constant shifts are hindered by the clumsy gear lever. Out on the highway, all of the 400Nm of torque wraps up the low and mid range (1700-2700rpm) to help the Hexa move along at good speeds. The cabin is well insulated from engine and road noise, though some amount of wind noise does crop up around the front windshield at higher speeds. The fuel efficiency figures also support the argument that the Hexa is a better vehicle for the open highway. In our instrumented tests, the Hexa achieved a city fuel efficiency of 9.12kmpl and a highway fuel efficiency of 14.65kmpl. The Hexa achieved a 0-100kmph time of 14.30 seconds; braking was confidence-inspiring in spite of its heft – 100-0kmph took 42.40m. A highlight on the Hexa is its ability to tackle poor roads. It absolutely smothers them. The suspension soaks up bumps very well. While it does roll around the anti-roll bars at the front and rear keep the over two-tonne SUV from getting out of hand. You can take Hexa off-the-road too, though we did not have enough time to test it out properly. While Tata has showcased the Hexa’s capabilities off-road at purpose-built test tracks, these have been designed taking into account the SUV’s capabilities. There is a fourth ‘Super Drive’ mode - Rough Road - which can be helpful when taking the Hexa through tricky mild off-road situations. The torque-on-demand AWD system can distribute power between the two axles for the best traction, with as much as 35 per cent of the power being sent to the front wheels. Both the axles get limited slip differential which can help tackle slippery situations better. Electronic aids in the form of hill descent control (whose speed can be controlled via the cruise control buttons), hill assist and off-road centric stability-program (ESP) also give the Hexa some impressive off-road ability. In the real world, the front and rear overhangs, wheelbase and size make it a bit daunting to be taken on anything more than light trails - or purpose built tracks! Disc brakes all around along with the electronic stability control, traction control, ABS and corner stability control make it reassuring to drive and sit in. Dual front airbags are standard across all variants of the Hexa while the XT variants get side and curtain airbags as well. The Tata Hexa is a more appealing and capable offering than its predecessor. It’s subtly changed in every area to give a fresh and more premium feel. It looks sufficiently macho from the outside and more appealing on the inside. The multi-drive modes and the all-wheel drive setup give it a special quotient and added usability too. However, it has its shortcomings. The manual transmission can be irksome to use and if you plan to drive in the urban environment we would suggest you opt for the automatic variant. Irrespective of the drivetrain, Hexa owners will have to make peace with the less than expected sense of finesse inside the cabin. At Rs16 lakh ex-showroom for this top-end manual variant, we had reason to expect more. Still, we can’t deny that the Hexa packs in a lot, be it in terms of space, technology, features and safety systems. So, the Hexa makes for a capable and value-for-money pick - just don’t expect it to be the best.